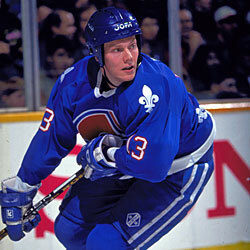 Sundin began his NHL career with the Quebec Nordiques who selected him first overall in the 1989 NHL Entry Draft. The longest-serving non-North American-born captain in National Hockey League history, Mats Sundin enjoyed a prolific 18-season NHL career as well as a superb international career playing for Sweden, his homeland. Mats Johan Sundin was born February 13, 1971 in Bromma, Stockholm, Sweden. Having starred locally, the 17-year-old Sundin joined Djurgardens IF Stockholm in the Swedish Junior League in 1987-88. He played the following season with Nacka HK in the Sweden second-tier Allsvenskan league and then led Djurgardens IF in the Elitserien to the Le Mat Trophy championship in 1989-90. Sundin was drafted first overall by the Quebec Nordiques in the 1989 NHL Entry Draft, becoming the first European-born player ever drafted first overall through NHL history. Mats debuted with the Nordiques during the 1990-91 season, scoring his first NHL goal in his first game. 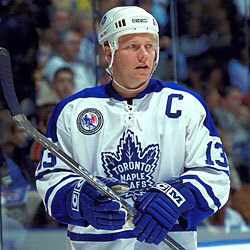 After four seasons in Quebec, Sundin was traded to the Toronto Maple Leafs in June of 1994. Sundin's confidence and production grew, leaping from 59 points as a rookie to 76 points in his second NHL season and then catapulting to a career-high 114 points in 1992-93. He collected 85 points the next season, his last in Quebec. The Toronto Maple Leafs shocked their fans, trading the immensely popular Wendel Clark as well as Sylvain Lefebvre, Landon Wilson and a first round draft pick to Quebec in June 1994, receiving Sundin, Garth Butcher, Todd Warriner and a first round draft pick in return. Sundin's debut with Toronto was delayed due to the NHL lock-out. He returned to Sweden to play for Djurgardens IF. When the NHL season resumed, Sundin's presence was felt immediately as he led Toronto in scoring through the shortened season. a decade, making him the longest-serving non-North American-born captain in National Hockey League history. In 1996-97, Sundin had his strongest season point-wise during his time with the Maple Leafs, scoring 41 goals and 53 assists for a 94-point season, seventh-best in the NHL that season. When team captain Doug Gilmour was traded to the New Jersey Devils during that season, Sundin was named as his successor, the 16th Maple Leafs' captain and the first European captain in franchise history. In 2001-02, Sundin finished fourth in NHL scoring with 80 points, including 41 goals. 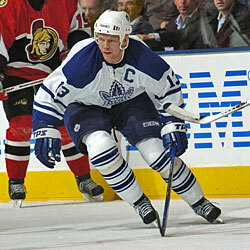 Shortly after the 2006-07 season had begun, Sundin became the 35th player in NHL history to reach the 500-goal plateau. The next season would be his last as a member of the Toronto Maple Leafs. Mats led the Maple Leafs in scoring in twelve of the thirteen seasons he played in Toronto. He stands as the all-time Leaf leader in goals (420) and points (984). On the international stage, Sundin served as captain of the gold medal-winning Swedish team at the 2006 Olympic Winter Games. Mats became a free agent in July 2008, and while he was courted by several teams, he chose to hold out at the beginning of the 2008-09 season. While pundits debated whether Sundin would retire, in December, he signed a one-year deal with the Vancouver Canucks. Although he bolstered the team for a Stanley Cup-run, the Canucks fell short that spring. At a media conference held on September 30, 2009 in Stockholm, Mats Sundin announced his retirement. Sundin retired having scored 564 goals, 785 assists and 1,349 points in 1,346 regular season NHL games. He added 38 goals and 44 assists for 82 points in 91 playoff contests. He was a Second Team All-Star in 2002 and 2004 and was awarded the Mark Messier Leadership Award in 2008. To honour an extraordinary career, the Toronto Maple Leafs raised Mats's number 13 to the rafters in February 2012. At the time of his retirement, Sundin stood as the Toronto Maple Leafs all-time franchise leader in goals (420) and points (987). Internationally, Sundin played for Sweden on many occasions. He played in the European Junior Championships in 1989 and 1990, and in the World Junior Championships in 1990, as well. In 1991, Mats competed with Sweden in the Canada Cup and was named to the All-Star Team. He played in the World Championships on six occasions (1991, 1992, 1994, 1998, 2001 and 2003), taking the gold medal in 1991, 1992 and 1998, silver in 2003 and bronze in 1994. He was also selected for the World Championships All-Star Team in 1992 and 2003. Mats competed for Sweden at the Olympics in 1998, 2002 and in 2006, when they collected the Olympic gold medal in Turin, Italy. In 2002, Mats was selected as one of the Olympics' All-Stars. Sundin and the Swedes also participated in the World Cup of Hockey in 1996 and 2004, earning All-Star designation in 1996. A quiet leader, the durable Sundin is regarded as one of the finest Swedes to have played in the National Hockey League, and one of the greatest Toronto Maple Leafs of all-time. 1987-88 Nacka HK Jr. Swe-Jr.